You’re addicted! You can’t get enough… and we understand. Select the desired block time below and click ‘Book Now’ to purchase. Multiple combinations of block times can be bundled in the shopping cart for checkout in one transaction. Once you’ve tasted flight, your world changes. How can you get more of this natural drug that lifts you off your feet and makes you feel so good? Yep, you’re sounding like a repeat flyer! You want more and we want to give it to you! Since 2008, we’ve been feeding the flight addictions for indoor skydiving Charlotte NC enthusiasts from all over the Carolinas, Virginia, Georgia and frankly the world! What we have is something special. 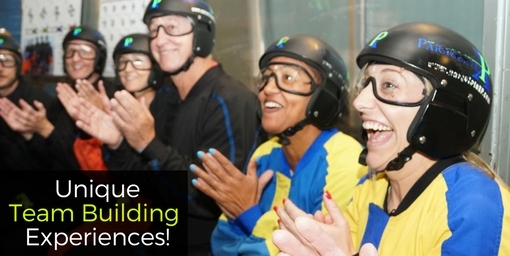 As one of the top three largest indoor skydiving wind tunnels in the world, we offer a vast space which allows our guests to fly without running into the walls seemingly every few feet. Combined with a great space is a world class cadre of flight instructors who are amazing! Of all the packages that we offer, the repeat flyer packages are ideal for those who have been through basic classroom training and have not purchased a membership. When booking repeat time, you can select different time blocks at different times and pay for it all at once. So, just pick and choose when you want to fly and for how long… it will be automatically added to your shopping cart. not have a history of neck, back, or heart conditions. Check with your Doctor. Paraclete XP SkyVenture has been serving indoor skydiving Charlotte NC, Raleigh-Durham, Virginia and Georgia proudly since 2008.